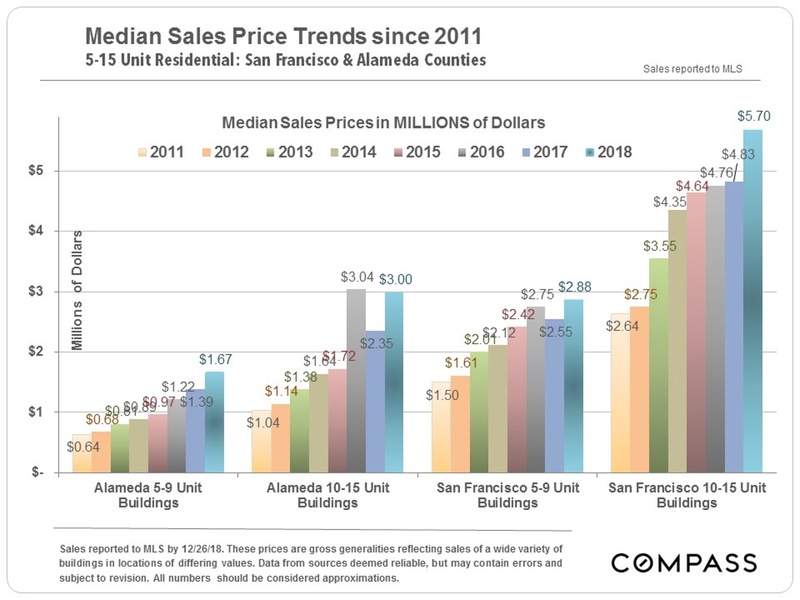 Economic, political and even environmental volatility were powerful factors in 2018, and promise to continue in 2019: There are a lot of spinning plates right now – locally, nationally and internationally – with the potential for both positive and negative impacts on local housing markets. 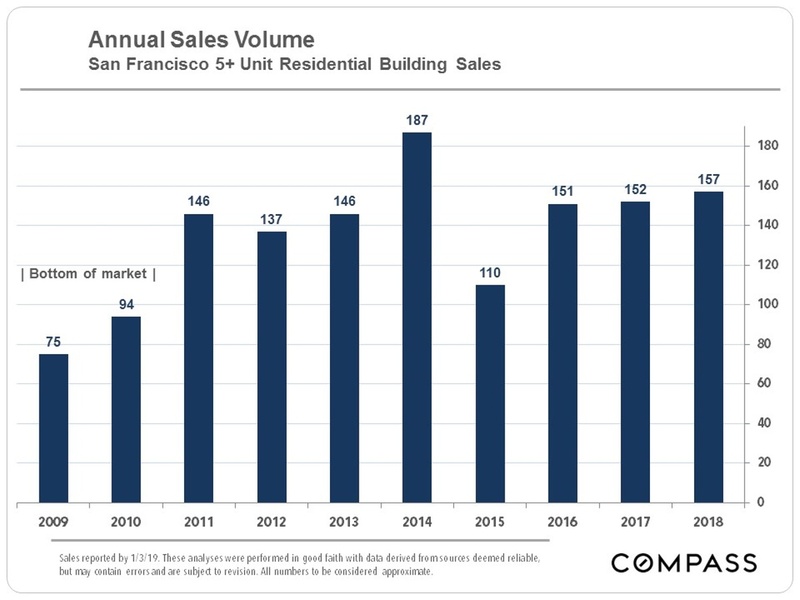 Generally speaking, last year was a strong one in Bay Area real estate, but varied between a hotter first half and a somewhat cooler second. 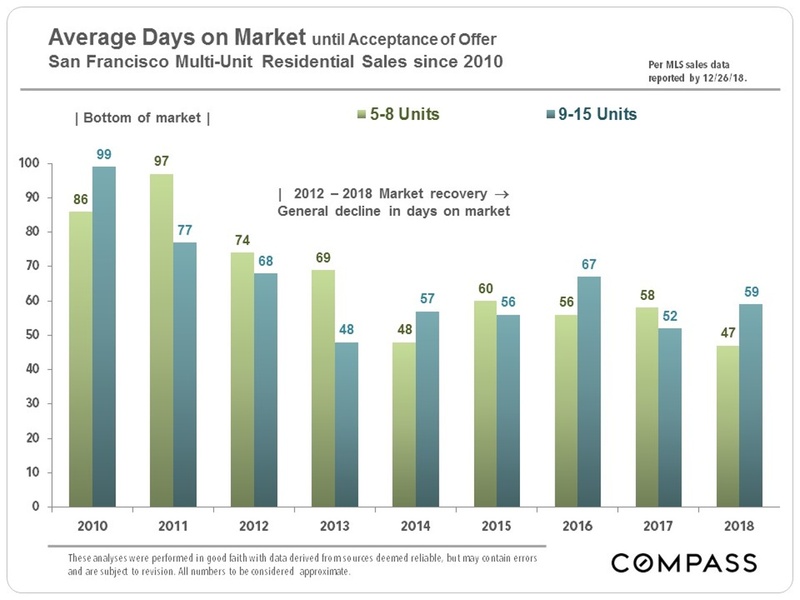 Our next significant indicators of market direction will probably come with the start of the spring selling season. 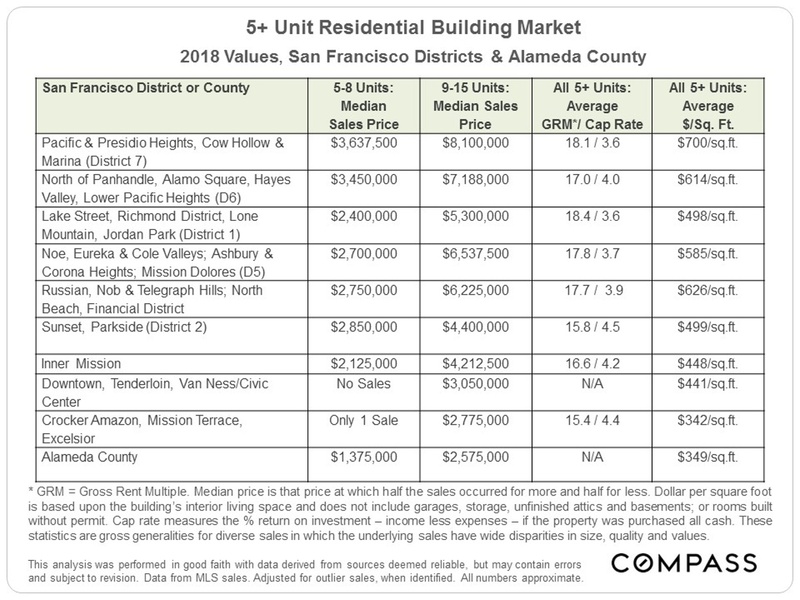 We have a table of 2018 SF building sales with various financial data points, which can be provided upon request. 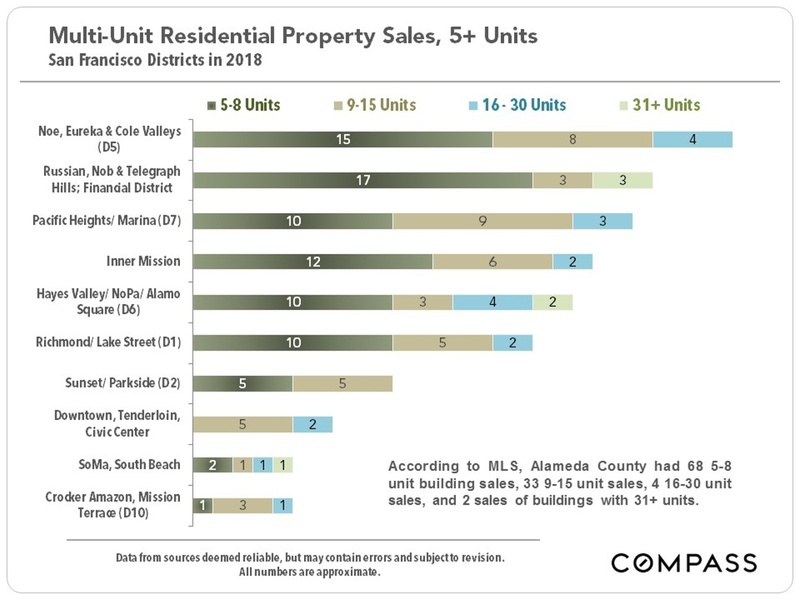 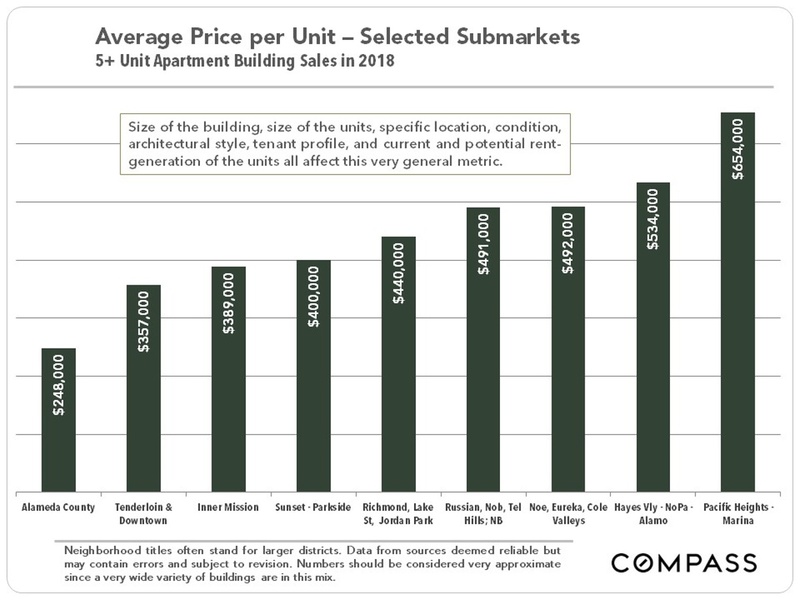 Many of the standard statistical indicators for the 5+ unit building market remained quite steady in 2018, though inventory levels of properties for sale have increased. 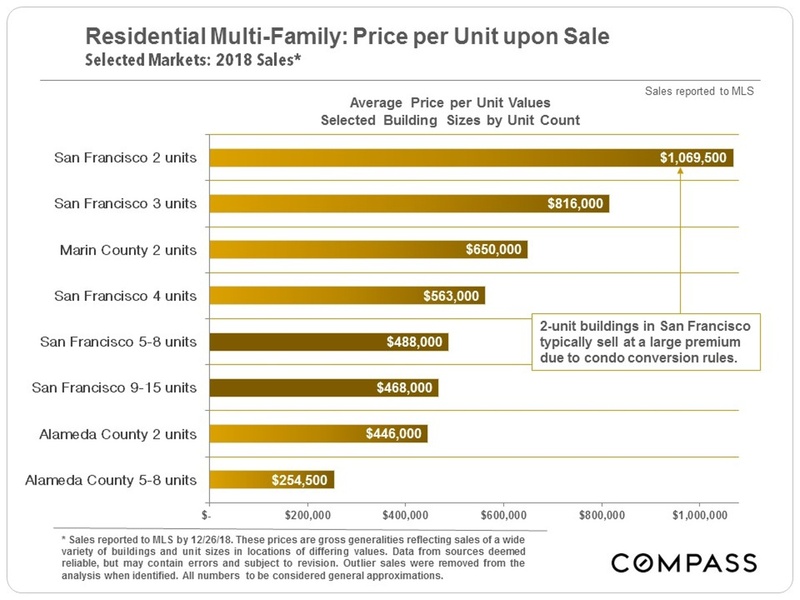 In the general real estate markets around the Bay Area, the softening of the market in the second half of the year coincided with both rapidly increasing financial market volatility and rising interest rates, though simple affordability was a large issue as well. 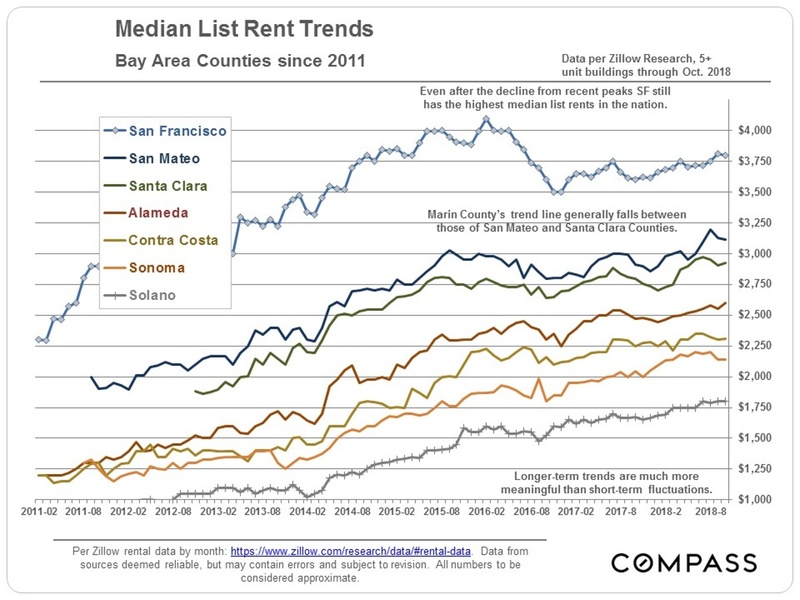 What is being measured and who is doing the measuring varies in the following charts. 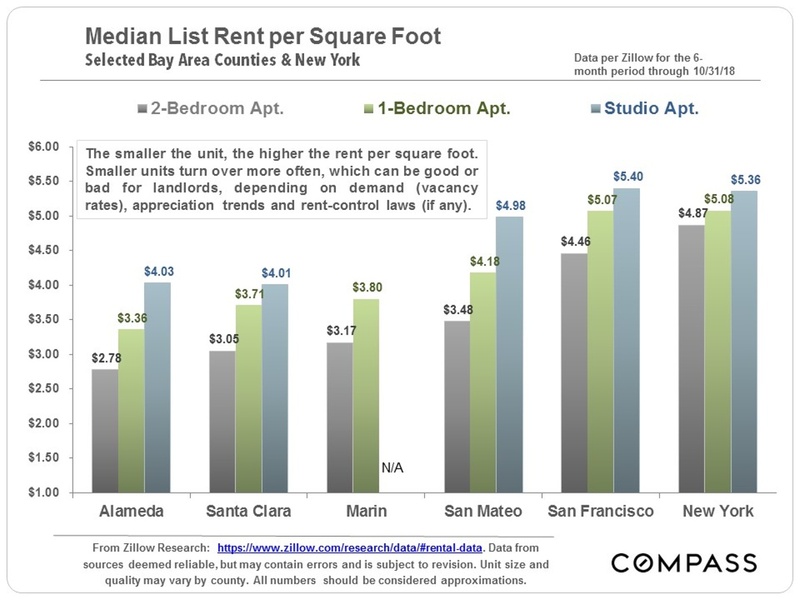 Some reflect median list rents for 5+ unit buildings, while others reflect weighted average asking rents for 50+ unit buildings. 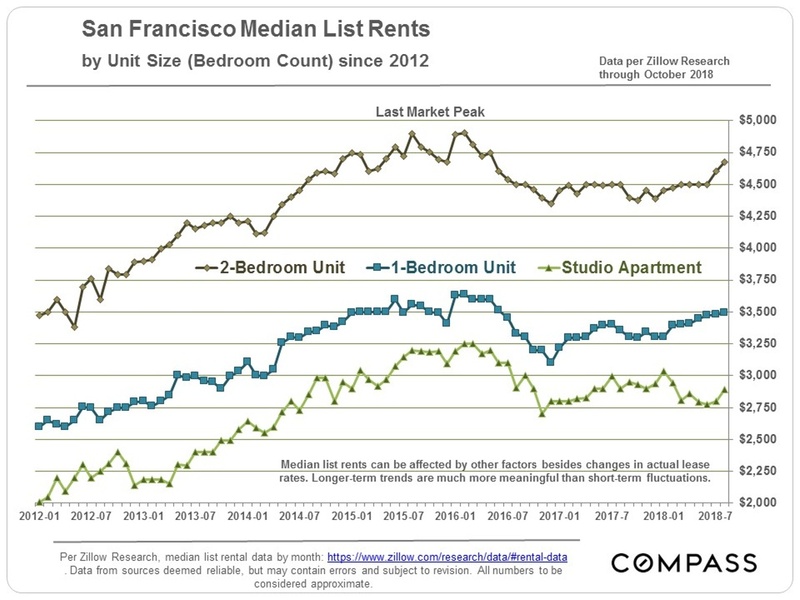 There is no definitive resource for tracking what rents are actually being paid for which units, and numbers will disagree between differing measurements. 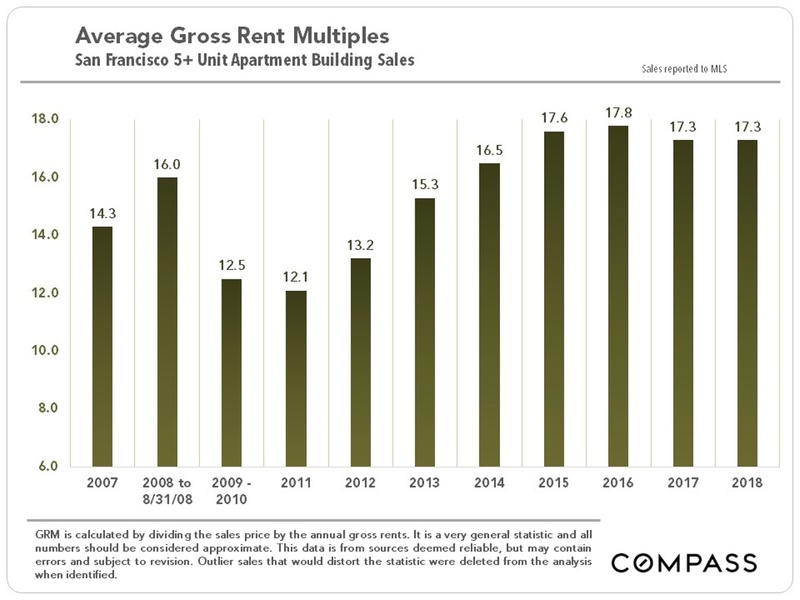 What is important in these charts are the sense of general values and trends over time. 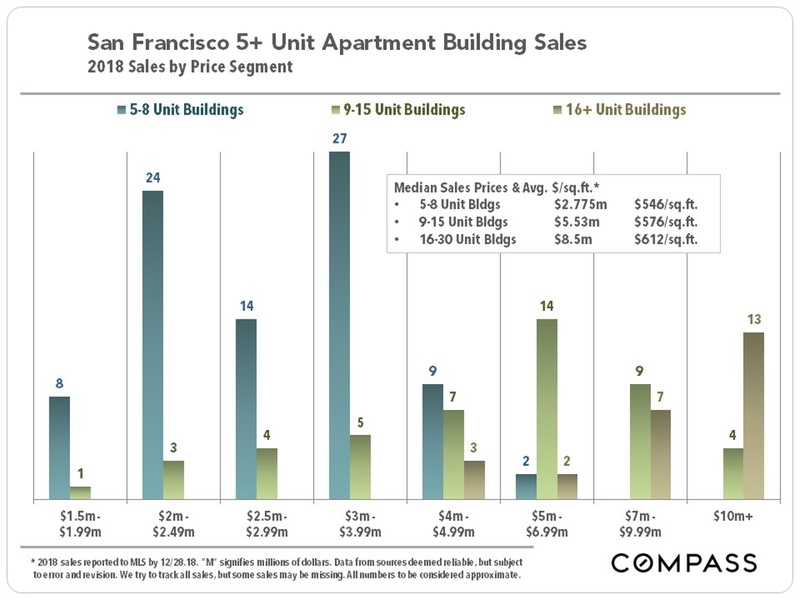 How they apply to any particular unit is unknown. 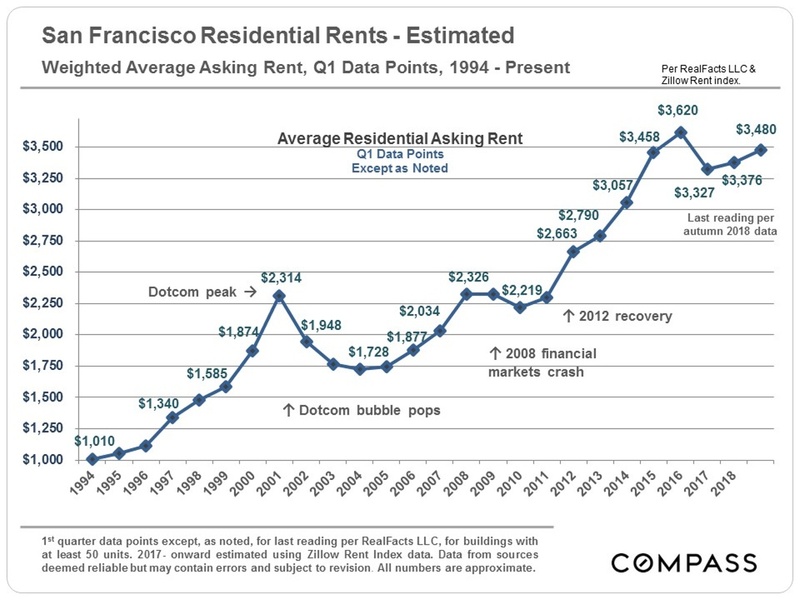 This next chart is a very approximate calculation of the impact of SF rent control on rental income over time as compared to market rents. 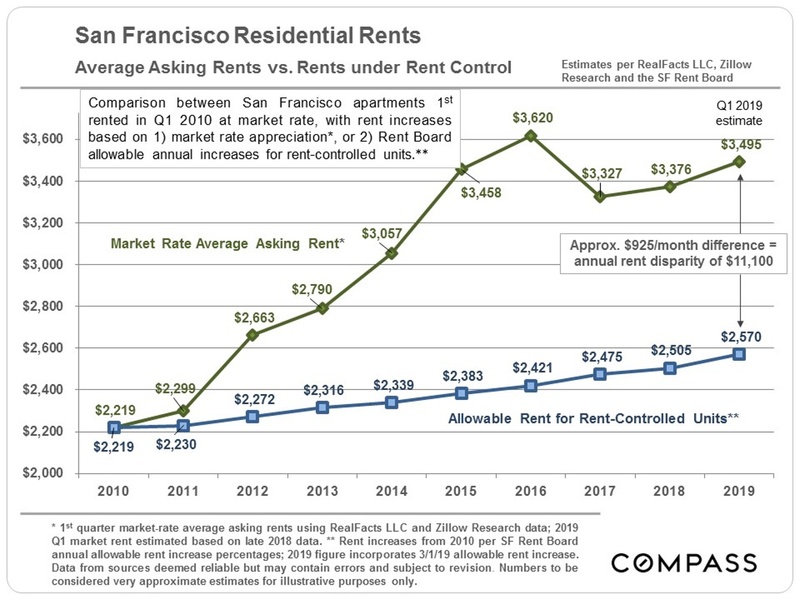 It adds up to a substantial amount of money for both landlords and tenants – which is why rent control is such a large, continuing political issue, especially in cities like SF and Oakland, with majority tenant populations. 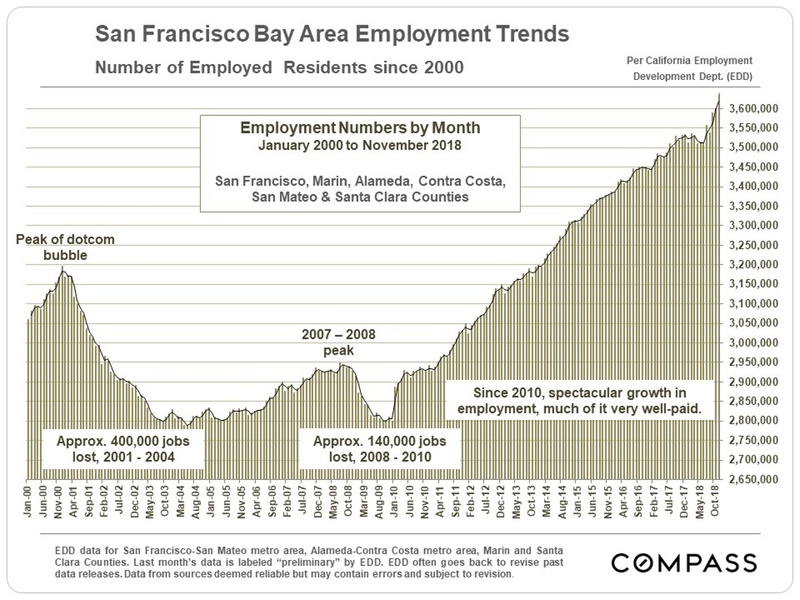 Employment growth – in many cases of very well paid jobs – has continued in San Francisco and around the Bay Area. 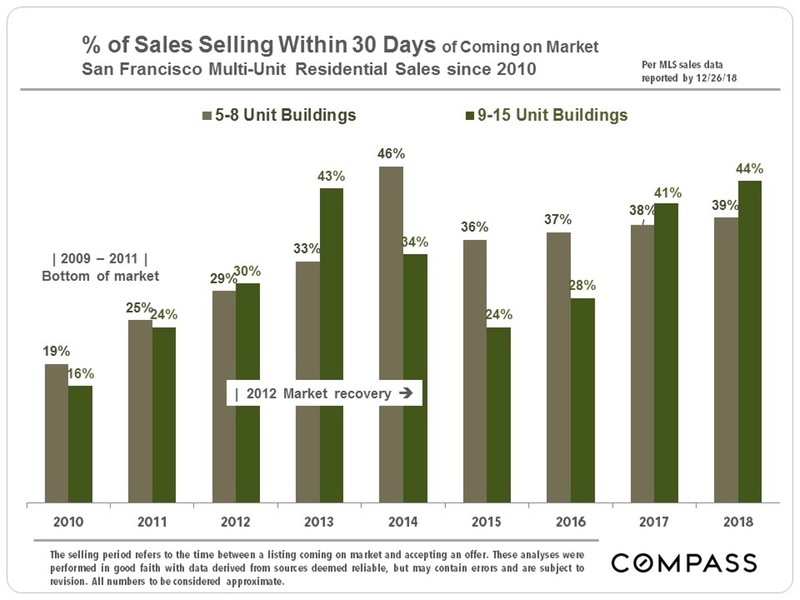 This, of course, is a huge factor in housing markets. 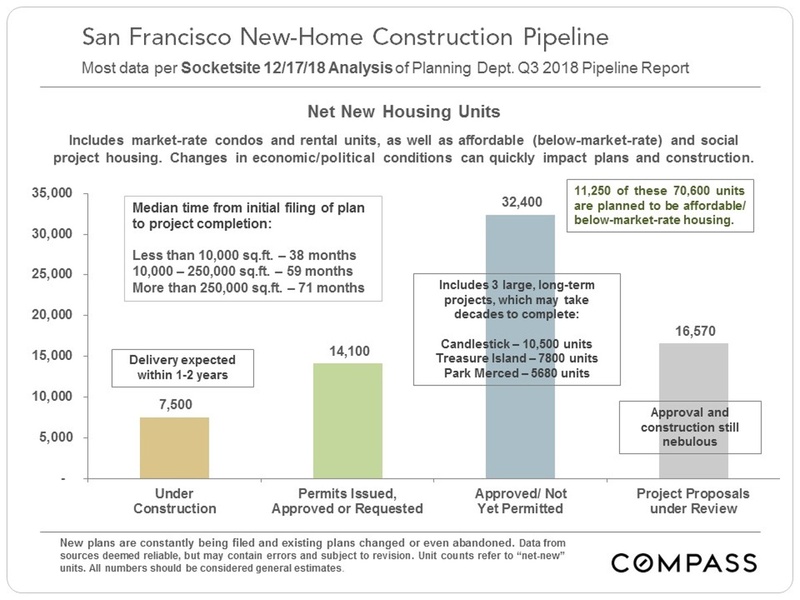 There are over 70,000 new housing units in the San Francisco pipeline, and Oakland’s pipeline has been swelling rapidly as well. 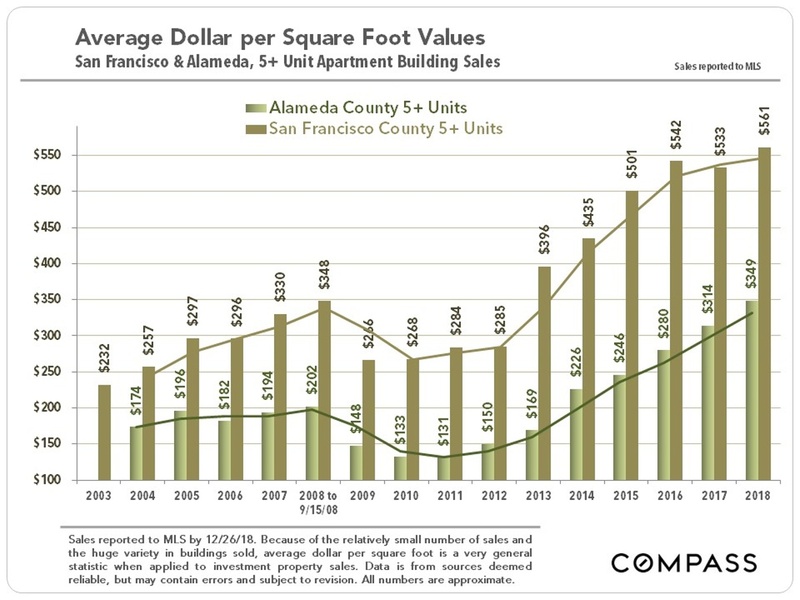 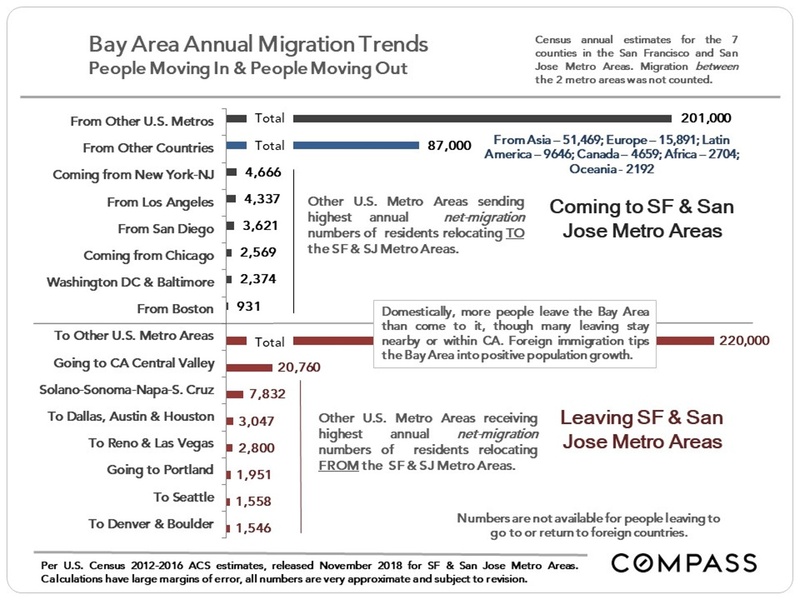 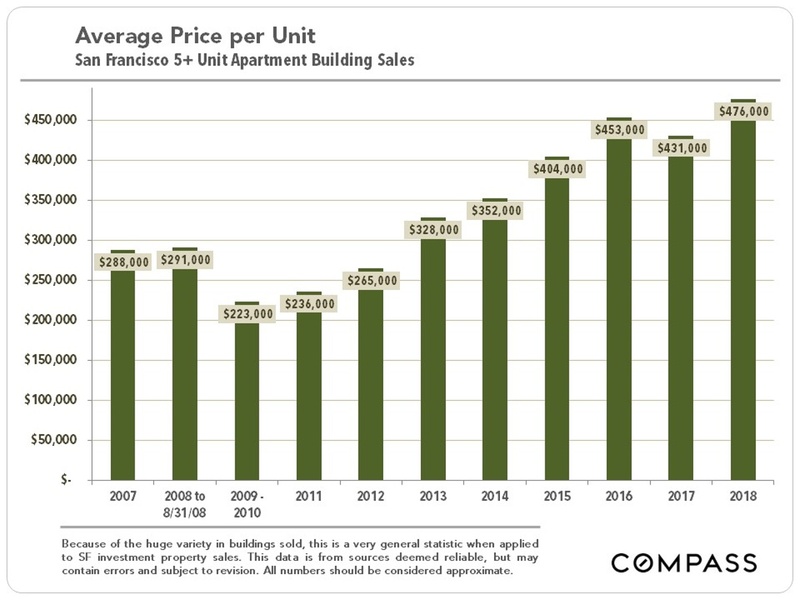 However, anecdotally, the word is that developers are quickly pulling back in SF due to increasing land, labor and affordable-housing costs, as well, perhaps, to increasing economic uncertainty. 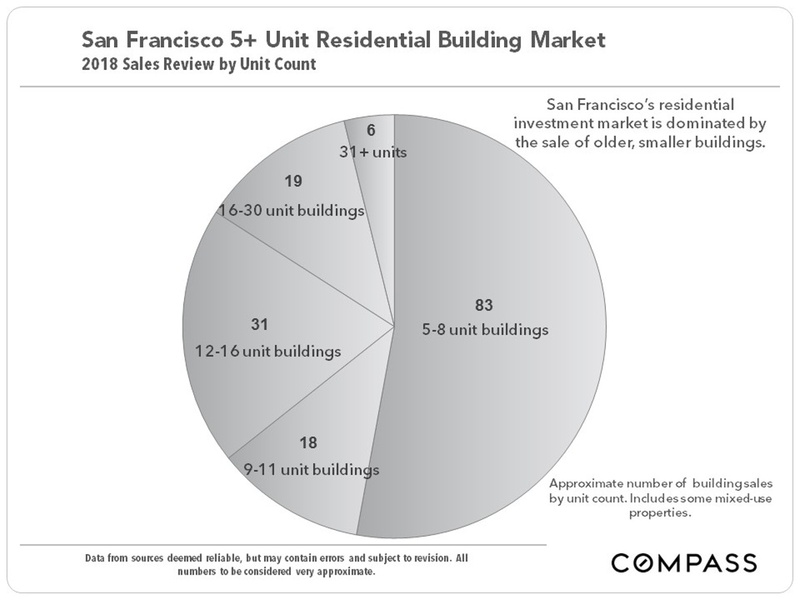 Which may mean that many projects currently in the pipeline may not be built in the near future. 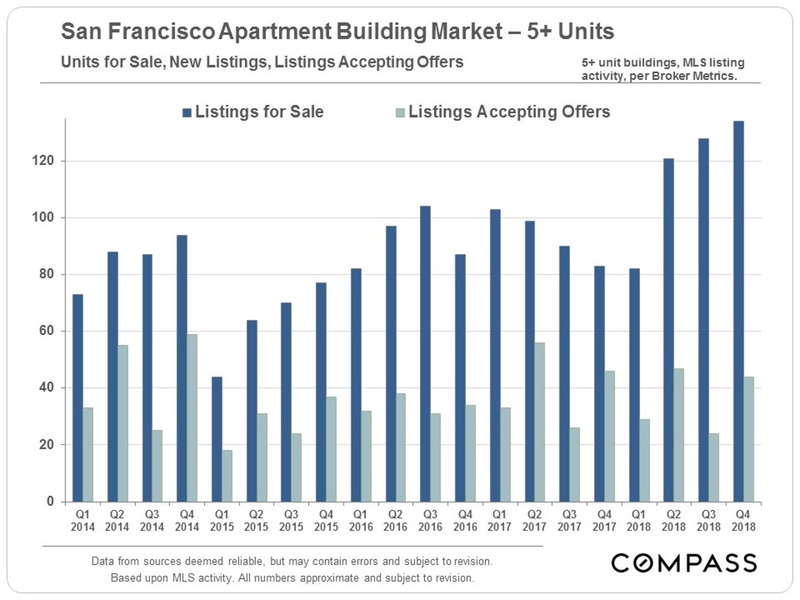 For existing landlords, that would mean less new supply coming on market and less competition for tenants from new apartment projects. 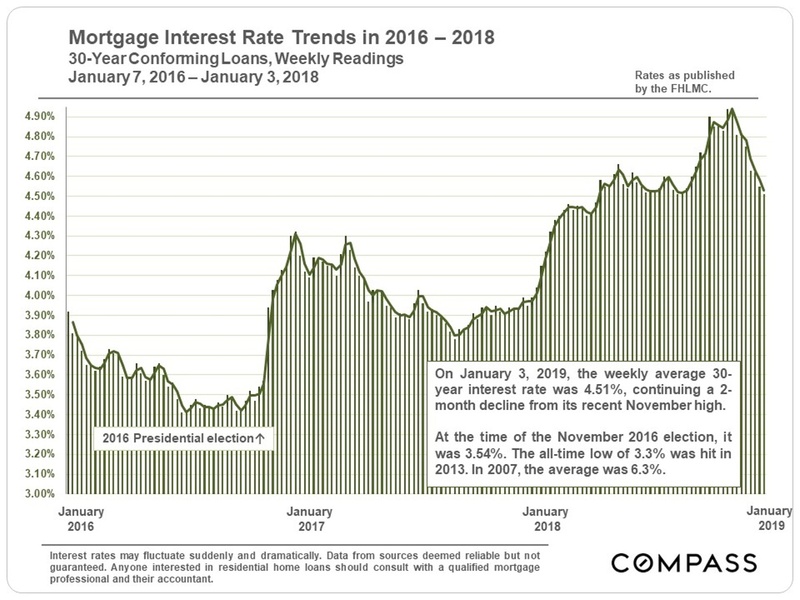 After climbing significantly through November, interest rates have been dropping since then, through the first week of January. 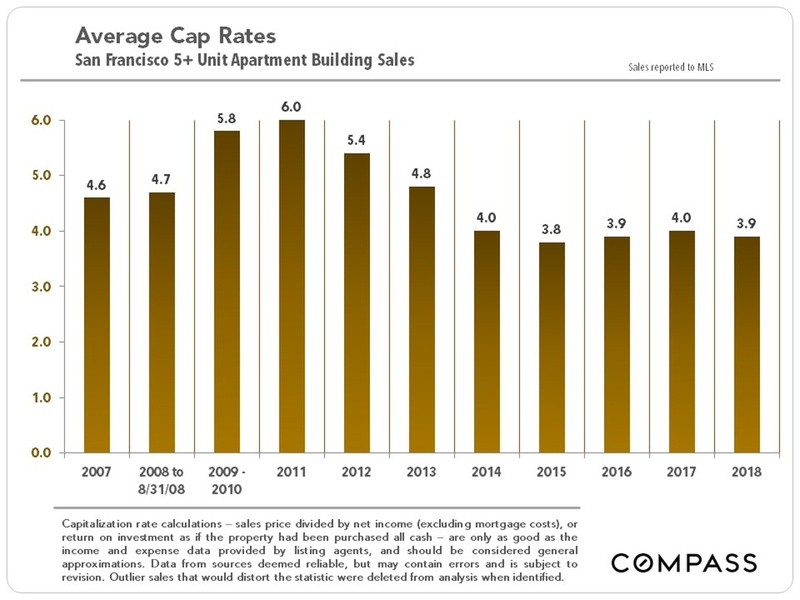 However, rates are still much higher than the lows seen in the last few years, and predicting what will happen in the near future is very difficult indeed. 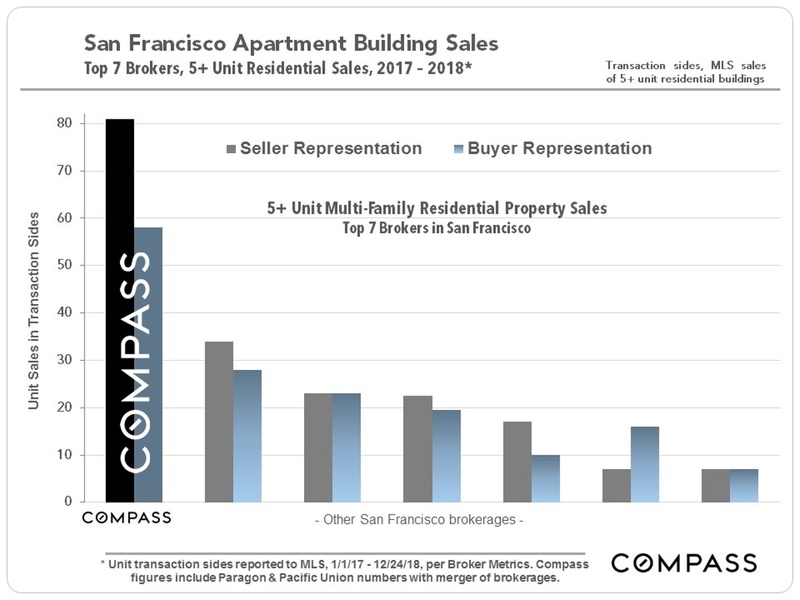 With the mergers this past year of Paragon Commercial and Pacific Union Commercial into Compass, Compass has become, far and away, the dominant brokerage in the multi-unit residential investment market.